This is the second in a series of article articulating the Lake Minnetonka Association’s vision for Lake Minnetonka. The Lake Minnetonka Association’s vision for better protection against aquatic invasive species, or AIS, is that aggressive and comprehensive protection is needed, some of these measures will require new thinking and we are now largely unprotected. AIS not yet in Lake Minnetonka include zebra mussel, spiny waterflea, hydrilla and viral hemorrhagic septicemia – and there are many more as well. All of these invasive plants, animals and viruses are brought into lakes by boats and trailers, which makes the focus of prevention actions easy, at least in concept. The challenge will be to implement meaningful and effective protections while at the same time minimizing inconvenience and maintaining rights to use this public resource. The Lake Minnetonka Association believes that a) the level of protection is not currently adequate and b) because for most of the new AIS there are no remedies, protection is the only practical strategy. 1. Comprehensive Physical Inspections using human or automated approaches are critical. Currently, human inspectors or automated devices cover about 1/3 of the total boat activity at public launches. Inspections should also require assurances that incoming boats and trailers are dry inside and out. The Lake Minnetonka Association recommends all public, private and municipal access have inspectors or automatic surveillance and current LMCD ordinances be enforced. Because there are many public and private accesses on Lake Minnetonka, the prospect of comprehensive coverage with inspectors is costly and inefficient. To better facilitate effective inspections, some access should be closed at some times. 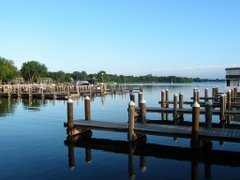 Because Lake Minnetonka is a public resource, assurances should be provided to permit access to the lake with a minimum disruption and inconvenience. The Lake Minnetonka Association recommends some accesses be closed at some times to facilitate the comprehensive inspections recommended above, but assurances should be provided to not restrict public access overall. Because AIS are transported via boats and trailers, a fee based on boat/trailer usage is proportional to the risk of introducing AIS. There will be costs for implementing many of the protection elements in this plan, so assessing fees based on boat/trailer usage is reasonable. There are historical, cultural and policy hurdles to overcome for this proposal. The Lake Minnetonka Association recommends fees be assessed to boats and trailers using Lake Minnetonka to support AIS prevention programs. AIS introductions in lakes that are tributary to Lake Minnetonka will have a ready access to Lake Minnetonka via their surface water connections. Therefore the protection activities we propose should be applied to tributary lakes as well as to Lake Minnetonka. The Lake Minnetonka Association recommends prevention activities, such as inspections, restrictions and fees, should be implemented on lakes that are tributary to Lake Minnetonka. The Lake Minnetonka Conservation District should enforce its AIS provisions for Special Event participants. To our knowledge, the inspections or washings as required in the ordinance are not occurring. The Lake Minnetonka Association recommends that inspections and/or washing of all watercraft participating in Special Events be required. Further, because participants in Special Events include out-of-state watercraft, we recommend all participating watercraft demonstrate they contain no water in their live wells or no live bait. The Lake Minnetonka Conservation District should upgrade and enforce its prohibitions. The LMCD code prohibits any plant fragments on boats or trailers within boat launch areas. This has not been enforced. The LMCD ordinance does not specifically define or prohibit other AIS. The Lake Minnetonka Association recommends the LMCD’s ordinance should be amended to specifically include prohibited and regulated invasive species. The LMCD should better enforce the above-referenced sections of its ordinances. There is no practical way to reduce the risk of AIS introductions to zero. However, the Lake Minnetonka Association believes AIS prevention must substantially reduce the risk of AIS introductions. Furthermore, unless the risks are substantially reduced, half-measures are poor public investments. The Lake Minnetonka Association recommends the overall risk of AIS introductions be reduced by at least 90% compared to the present baseline. The complete position statement (Prevention of Aquatic Invasive Species) can be found on our web site. We believe the new thinking we present will help the overall efforts to better protect and manage Lake Minnetonka now and in the future.